Jesse's cousin is getting married this weekend and the reception is at the aquarium (sweet!). Per usual, I procrastinated purchasing a gift until Monday and when I pulled up their registry, just about everything had been snapped up - lucky ducks! The only option left was a $200 floor cleaning thing-a-ma-jig which was a little outta my price range. There was also a gift card option, but, meh. They're kinda impersonal, aren't they? I noticed the couple had lots of wine accoutrements on their registry, so I thought a couple bottles would be a nice way to help them stock their wine cabinet. I wanted to jazz up the bottles and make them feel special so here's what I came up with. It's pretty darn cute if I do say so myself! For the labels, I wrapped black paper around the wine bottles and held them in place with clear tape. 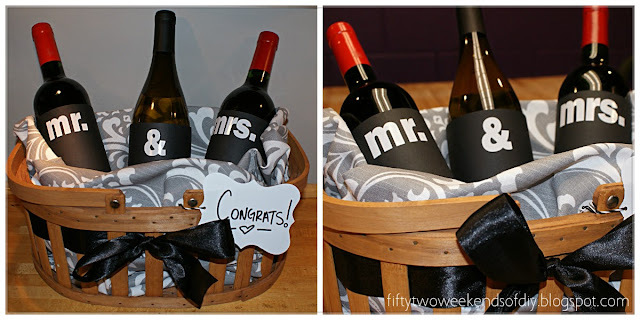 Then I used vinyl stickers to add "mr. & mrs." I stuffed some fabric into a basket I found at the goodwill and finished it off with ribbon and label. basket - the one I used is secondhand. I REFUSE to purchase new baskets; they are everywhere at thrift stores, estate sales, etc. I love the vintage look of this one and was "this close" to keeping to for myself!